"We've had snow here for the last seven months and I'm fed up with it" said the lady in the gas station who'd stopped to chat. We were in the small village of Vuotso in northern Finland which, even in May, was under a foot of fresh snow. 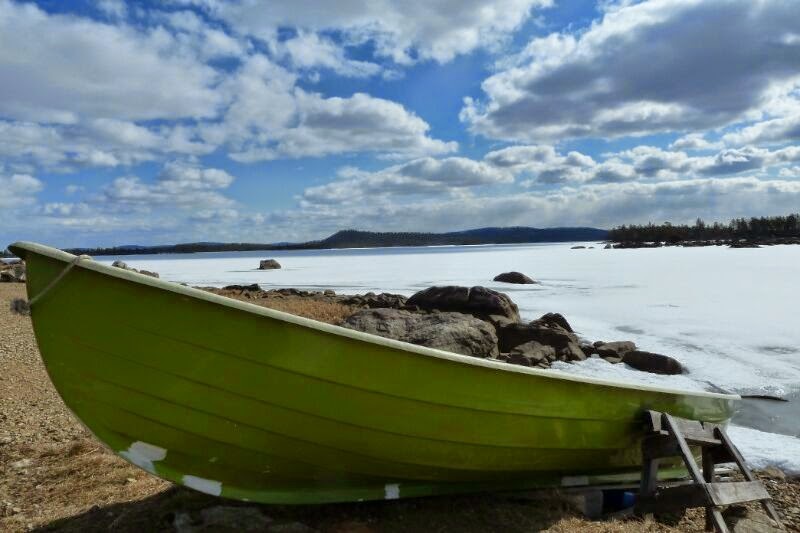 Of course the local opinion was at odds with our own view of the snow which had given us a magical journey and an edge of adventure as we cycled through Arctic Finland. 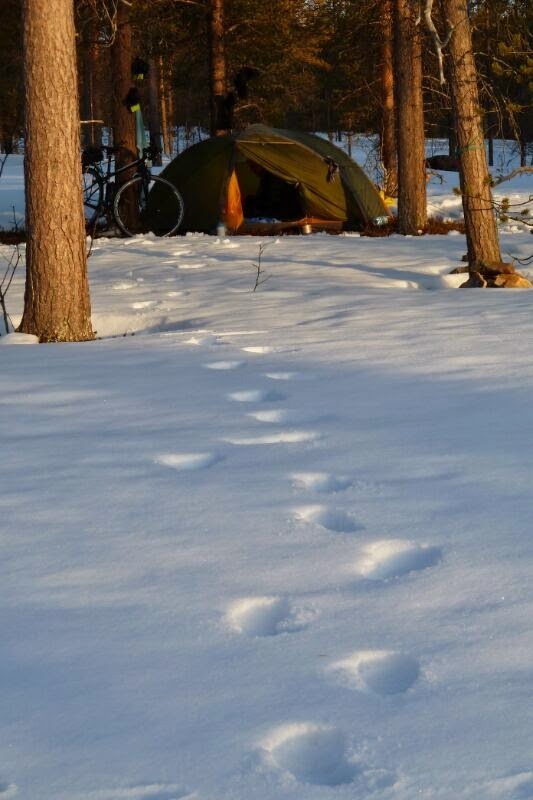 This last week of cycling and camping has been cold and snowy. Vuotso was the only village on a long stretch of empty, winter road. Much of the landscape in this area has been open snow-covered plains, sparsely covered with pine forests. Our brief stop at Vuotso was one of many gas station stops that have become a regular part of our day as a place to eat our picnic lunch warm indoors, heat up with a cup of coffee or pick up groceries, water for cooking and petrol for our camp stove. For local people on remote roads the gas station is also the grocery store, the bar, the cafe, the cinema and the post office. One day we were having coffee in a gas station to escape a heavy snow shower, when a long line of people trooped into a room at the back for an afternoon ballroom dancing lesson. 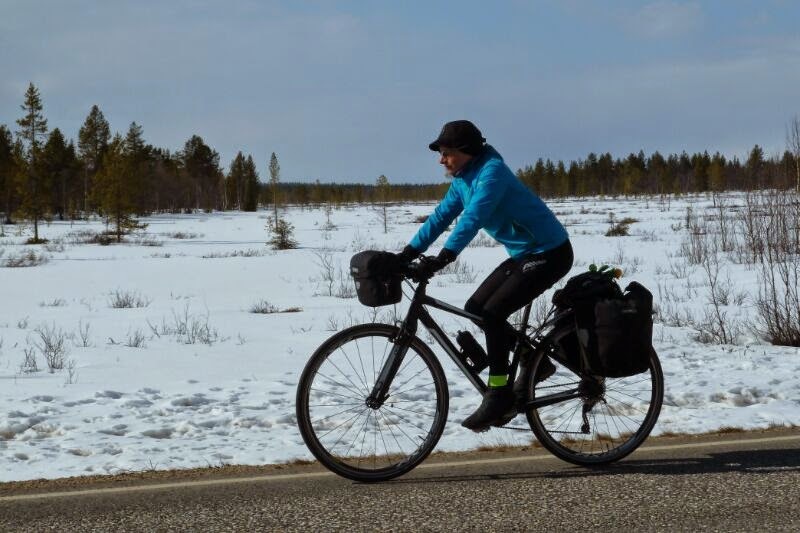 It's become progressively colder and more snow-covered as we've cycled north through Finland and at times our road has climbed to high, exposed places where the pine forests give way to thin, stunted birch trees. We've camped in temperatures as low as minus 10 and cycled in minus 4. Mostly it's the north wind that adds a bitterly cold edge to the day and we often cycle with numb hands and freezing feet. 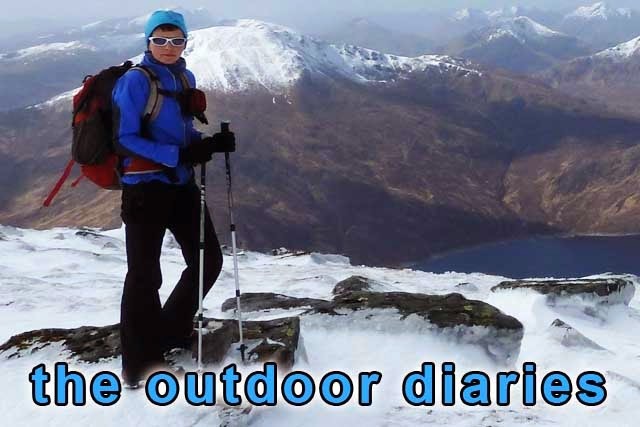 The hardest things are forcing ourselves out of cosy sleeping bags in the mornings and doing the small fiddly jobs around camp that you need bare hands for such as cooking or washing. I'm talking about washing the pots as we've had few chances to wash ourselves or our clothes since most campgrounds in Finland don't open until June. And so we've often camped in the snow- covered woods, forcing our tent pegs into ground that's still frozen. It may be cold but on the plus side, we've had spectacularly sunny days and endless blue skies. The snow sparkles in the crisp, northern light and the trees cast long shadows across the white snow. Every now and then our road crosses the vast, surreal, white plain of a snow- covered, frozen lake. Sometimes cranes are gathered on the ice and whooper swans are cautiously exploring any free water. However, the most magical moment is when we are pedalling along in sunshine and a shower of snowflakes starts to fall gently from the sky. There have been many highlights to our journey through Finland. We'll never forget the vast blue lakes of the south or cycling through the beautiful winter landscape of the Arctic. And we'll never forget meeting Santa Claus at his Lapland headquarters. It's a horrible tourist trap, deserted at this time of year, with old grey snow scraped back from an ugly car park. We'd agreed that if we could do it for free, we would get a photo of ourselves and our bicycles with Santa Claus. As the place wasn't busy, the man himself duly obliged. It was a silly moment, getting my picture taken with an actor in a Santa costume at a theme park but I have to confess it put into the heart of this 44-year-old woman, a little sprinkle of magic! We've cycled into Norway now to pedal even further north to mainland Europe's most northerly point, the North Cape. 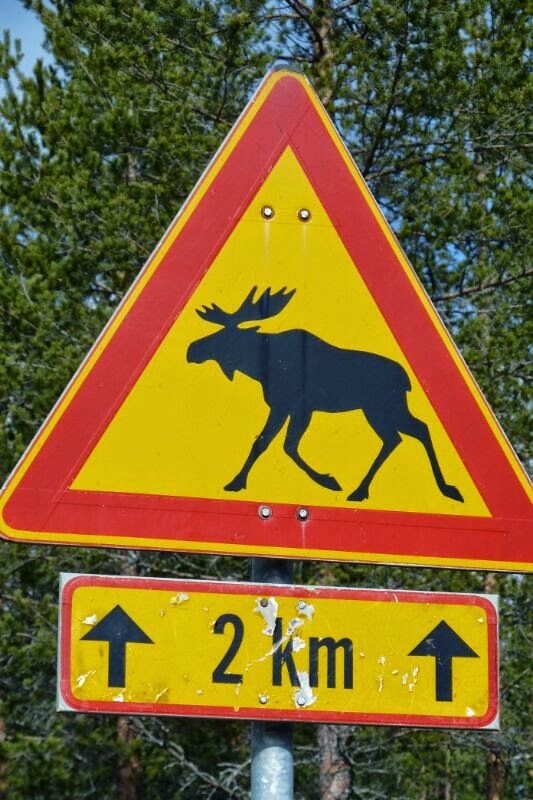 But Finland had one final treat in store for us as we approached the border when two giant moose galloped across the road in front of us and disappeared into the snow-covered woods. 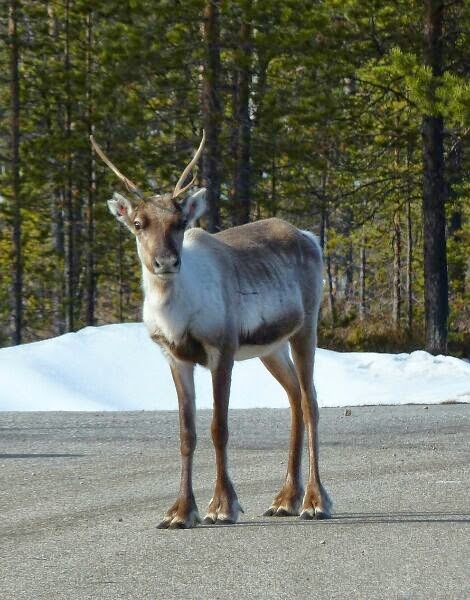 It was too fast for a photo but here's one of a reindeer! 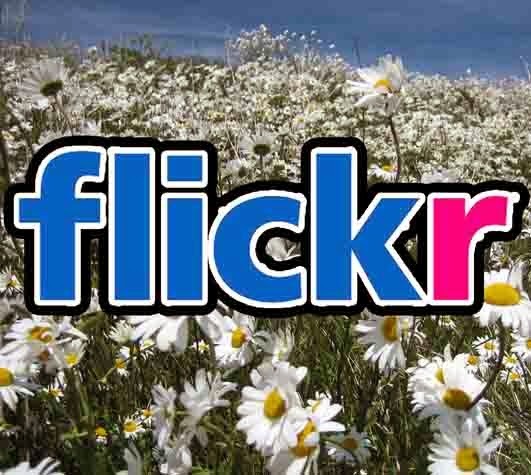 More pics on flickr - click on the link. Route - cycling north from Oulu we picked up national cycle route 4 which looked like it followed the coast but we didnt see the sea until we left the route at Kemi. It ws also disapointing in that it was in a busy highway for much of the way. 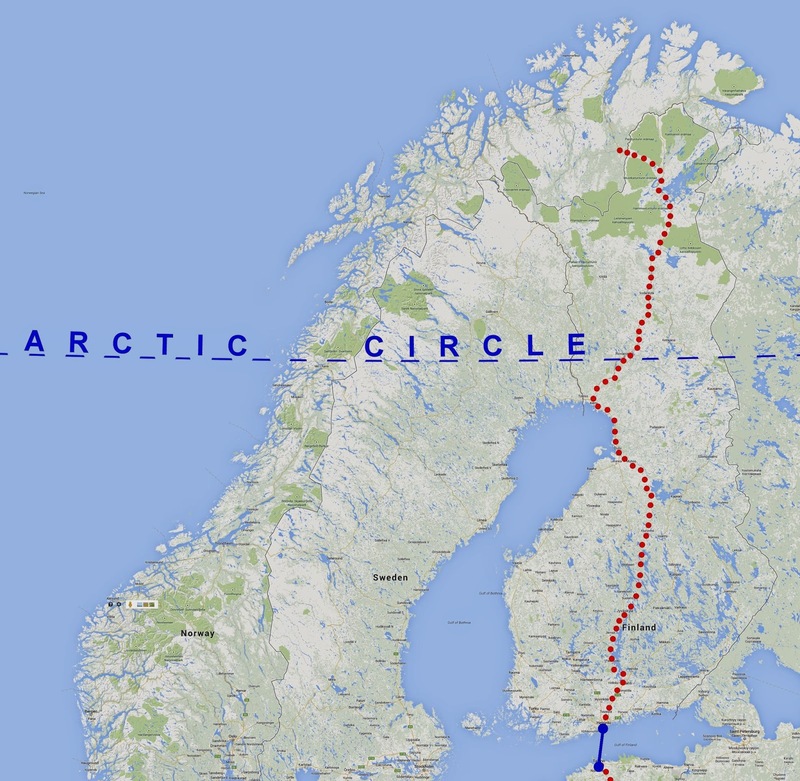 We turned inland to the city of Rovaniemi and crossed the Arctic Circle 8km further on. We've a straight line north on the main road through Sodankyla, Ivalo and Inari which wasn't our original plan but a forecast for severe weather changed our route. The main road was not too busy and got more quiet. Highest point was 365m. We've crossed into Norway here at Karasjok, the traditional Saami capital. There's still a lot of snow here and very cold temperatures. More later on the kit we are using to deal with that. Not far to go now and you will be on top of the world, well nearly. How strange is it to have so many hours of daylight and is sleeping a problem?